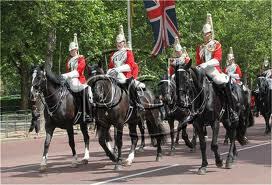 There is no more eloquent testimony to the orderliness of London than the mere sprinkling of cavalry within its limits. It may seem ridiculous to the foreigner that with 375 mounted police, and two small regiments of Household troops numbering 275 horses each, five millions of people are content to behave themselves; but it is a state of affairs of which Englishmen have no cause to be ashamed. Even adding in the six battalions of Foot Guards and the line battalion at the Tower, and considering that there is Woolwich, and that there are Hounslow and Windsor not far off, and that there are facilities of communication—not, however, greater than exist in other capitals—we shall find that the police, and military ready to be used as police, in and about London, are a mere handful compared to what are necessary for peace-keeping and ceremonial purposes in the cities across the Channel. “At one time the black horses of the Household cavalry came almost entirely from Yorkshire and North Lincolnshire, most of them being expressly bred for the service. But of late we have changed all that. In those days the cavalry colonels had so much money allowed them for remounts, and they had to pick up their horses where they could, with the jobmaster at their elbow—for a consideration—to help them at a pinch; and some of the London jobmasters had a standing order to be on the look-out for likely horses for certain regiments. Nowadays the Dublin dealer has taken the place of the London man, and, instead of the colonel buying horses, the buying is done by the Remount Department, whose happy hunting ground is Ireland. “When a military horse is ‘cast,’ and all military horses are ‘cast’ at fourteen years old, whether they be good, bad, or indifferent, a requisition for a substitute goes to the Remount Department at Woolwich, and the substitute arrives a day or two afterwards from the Emerald Isle, generally shipped direct by Daly or some other Dublin dealer. That the new horse is as good to look at as the old Yorkshire one, we have not heard any soldier declare, but he is at least thirty per cent. cheaper, and he seems to be strong enough for his work. “A British army corps, when discoverable, will be found to have 12,000 horses, of which 3,134 will be in the cavalry and 2,987 in the artillery; these 6,121 horses ought to be thoroughly broken and trained, even if the remainder are not. There are said to be only 70,000 horses in the British Isles fit for army work, but this is one of those pleasant fictions of which it is When Napoleon attempted to invade us—an attempt that was defeated at Trafalgar, which to the uninitiated may seem to be a long way off for the defeat of such a scheme, although any future attempt will probably have to be reckoned with still farther at sea—the Government took stock of every horse in the kingdom, with the intention of a general impressment for military service; and nowadays the Government has power in times of national peril to lay hands on every horse within these islands, in preparation for which there are thousands of horses under subsidy with a view to immediate use. And when this seizure does take place, it will certainly not be to the joy of the jobmaster; he above all men shudders at the mere mention of foreign invasion, for invasion to him means the entire loss of his means of livelihood, and this at a sacrifice, for no Government would pay the price at which the jobmaster’s stud has been collected. 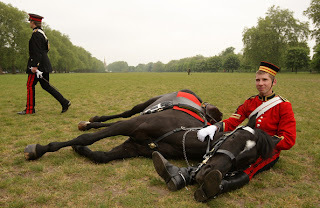 “The Life Guardsman’s horse used to cost 601., being the most expensive horse in the army; we shall not put him offensively cheap in these times at 201. less; nor shall we be divulging any secrets of state in estimating that the cost of mounting the two regiments of cavalry in London—barring the officers’ chargers—does not exceed 22,000L. And yet the horses are carefully chosen and seem fit for their work, when either in or out of harness. They, of course, look their best at Knightsbridge, for at Knightsbridge the stabling is distinctly good, better even than is promised in the new barracks in Albany Street; but then a soldier’s horse in stable generally looks better than a civilian’s, owing to his head being where his tail should be. The civilian’s horse always has his head over the manger; the soldier’s horse is turned round as soon as he has finished his feed, and so gets more fresh air; the consequence of which admirable arrangement for preventing a horse ‘ breathing his own breath,’ is that the visitor on entering the stable sees a double line of intelligent heads, .instead of an avenue of hocks and tails. “Time was when every soldier’s horse had a name, the initial of which was that of the troop to which he belonged. ‘A’ troop had all A’s, ‘ B’ had all B’s, and so on; but in these days the squadron is the unit, not the troop, and the name has given place to the number. Every horse, then, has his number placed on a card over his manger, and the horses are separated from each other by a pole doing duty as a bale, and on each upright is the horse’s kit, including the two spare shoes which every trooper carries, but not including the arms, which, of course, are kept elsewhere. This kit, and the arms and the rider, make up a nice little load, which averages out at twenty-three stone per man; not quite so heavy as that of our fat old knights, but still heavy enough for the class of horse which has nothing of the ‘dray’ type about it. 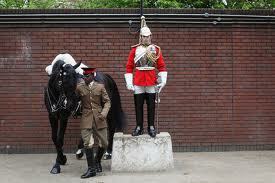 Of course the horse has to be of the regimental colour. 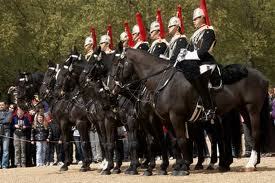 In the cavalry generally chestnuts are in and it is not easy to get these horses of uniform type and character. There are many exchanges and rejections, and it often happens that a horse sent in for cavalry work has to go to the draught, to the Artillery, or even the Transport service; so that though the remainder may not be examples of the much-talked-of survival of the fittest, they are at least representative of the not unfit. They are smart, workmanlike horses. It is absolutely necessary that a regiment should be as sound in its horseflesh as in its men. Theoretically no remounts are accepted that are not looked over on level ground, on a road, or in a large yard, for it is easy to pass a bad horse in a field, or on a hillside, or in deep pasture, or when under cover, or in a drove. It is not safe to choose an underbred animal, immediately conspicuous by his coarse head, or thick throat, or short neck, or large, bony joints, or clumsy legs, or short pasterns, or curly in the hair of his mane or tail. The typical cavalry horse must have a small lean head, a flat, broad forehead, fine, full nostrils, a good, clean throat, thin neck, well-shaped legs, long pasterns, and straight hair, with a deep, wide chest, and short, broad back and loin. No long backs will do, for long backs are not in favour, for chestnuts usually have white, and white, except in the Scots Greys, is not desirable; neither chestnuts then, nor mealy bays, are fit for cavalry work, but roans and bays and browns, and for our Guardsmen blacks. “These are bought when rising four years old, and require about six months’ training by the rough riders before they can be passed out of the riding school as efficient by the colonel. The Knightsbridge riding school is about forty-five yards long by sixteen wide, and in it perhaps fourteen young horses at a time will be at work, though the number of course depends on what the horses have to do. Their training is not as simple as might at first appear. The soldier has only one hand to work his horse with, and what an ordinary rider would do with the other hand he has to do with his leg. How skillfully he manages to guide by leg pressure is known to those who have seen the Musical Ride at the annual Military Tournament, which is little more than the ordinary practice of the riding school. But it should not be forgotten that the horse has to be taught to understand this pressure, and that his training is almost as long a business as that of his rider.